We have traveled the country to bring you all the color and excitement of college campuses and college football's game day. We've met students, alumni, fans, and had the time of our life! 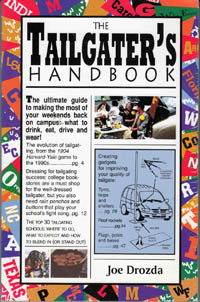 ..Way back in 1996, Master's Press published Joe Drozda's first book, The Tailgater's Handbook. This acclaimed book's publication is credited, by most, to be the most influential event that fostered tailgating as you know it today. Some call it "The Tailgating Revolution"! To collect material for the first book, Drozda traveled the country visiting college football games. One day he actually attended three games starting at Purdue and then going to Louisville and then Kentucky. He trecks to colleges today just to keep up on the latest gadgets and practices of the minions of tailgaters. He has been featured on all the national networks, hundreds of newspapers, major magazines like Newsweek, The Wall Street Journal and Sports Illustrated.